Whether you are an angler or not, I am pretty sure that quite a few people regularly observe fish jumping out of the water, be it at the beach or next to a lake or river. Some of these observers, being curious by nature, may also briefly ponder why do fish jump out of the water? In this article I will look at a few of the obvious answers, but also at the ones clouded in a bit of mystery and some of the hypothesis as forwarded by marine biologists and other experts in the field. As always there will also be a few anecdotal observations made by yours truly during various fishing trips and also my personal opinion on this quaint behaviour of fish. Now, let’s kick off with some of the obvious reasons. Most people are probably familiar with television documentaries showing different Pacific salmon species like coho, chinook or sockeye attempting spectacular leaps in order to overcome natural obstacles on their way to their spawning grounds. I am always amazed at the incredible show of strength, speed and stamina displayed by these amazing creatures in their efforts to negotiate (seemingly) impossible waterfalls and cataracts in their relentless obsession to procreate. 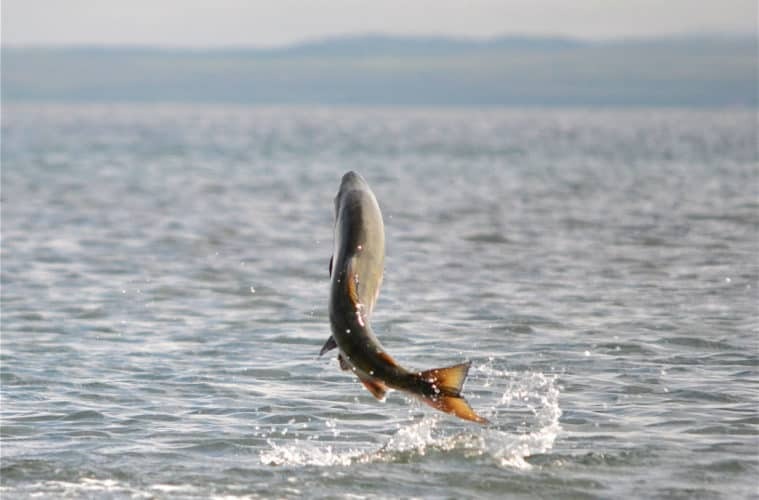 Although salmon are quite famous for these wonderful aerobatics, they are definitely not the only fish able to do that. Other fish species also display this behaviour although in a slightly less dramatic fashion. During the early 2000’s I lived in a small town called Villiersdorp which nestles in the mountains of the Boland. A small feeder stream of the Theewaterskloof Reservoir, the Elands River, runs through town. During my stay there I regularly observed rainbow trout negotiating various obstacles in the Elands River on the way to their spawning beds during spring time. At one specific juncture they had to scale a height of nearly two metres and their efforts to do so were, to say the least, quite commendable! In the natural world the concept of hunter and hunted exists among all living creatures and fish are no exception. The evolutionary arms race between species who want to eat other creatures and those trying to avoid being eaten is a deadly serious business. However, it is a misconception to think that predatory fish are constantly on the hunt. Most of the time they are just chilling or cruising around waiting for some evolutionary dinner bell to ring. This may be during a certain time of day or whenever the hunger pangs start gnawing. Among fish species very few attacks are really long distance chases. The bulk of them are sudden, vicious attacks where the attacker mostly relies on the element of surprise. If the baitfish can take evasive action by deftly moving out of the attacker’s way in good time, they has a better chance to remain in the gene pool. Smaller fish species normally gather in shoals containing a couple of dozen individuals up to a few million in the case of species like herring, sardines and anchovies. The fry of many fresh water species also congregate in schools of varying size for protection purposes. The flying fish, of which there are about 6 species, can be found in all of the oceans, particularly in tropical and warm subtropical waters. They have evolved long, elongated fins which can assist them in escaping predators by jumping out of the water and gliding above the water’s surface for as far as 400 metres and being airborne for 45 seconds. This truly is an amazing feat for an aquatic species and, again, just confirms what nature is able to achieve through natural selection. While fishing in the sea and targeting specific predatory species it is very important to look out for signs of terrified baitfish exploding out of the water in their attempts to evade hungry marauders. Any fortunate angler armed with a rod and some artificial lures being in close vicinity of such an occurrence is bound to experience an exhilarating angling session. Sometimes the food item is not in the water itself and then the hungry predator has to employ alternative strategies. Many a time I have witnessed bass leaping out of the water trying to catch hovering dragonflies buzzing like mini helicopters a metre or so above the water surface. I even saw one or two trying to catch low flying swallows! On fishing trips I also saw rainbow trout leaping about in a feeding frenzy attempting to catch as many mayflies as possible when the tiny insects were hatching and taking to the air for the first time. One of the most impressive jumping feats for food, however, probably belongs to the silver arowana of the Amazon basin. This fish species is also referred to as ‘monkey fish’ because of its unique ability to leap out of the water in an attempt to capture its prey. Its weirdly shaped mouth (something resembling a drawbridge) is specially adapted for collecting foods items on the surface of the water. These may include crustaceans, insects, smaller fish, and other small animals like birds, snakes and bats. The silver arowana has a habit of cruising along the water surface constantly on the lookout for potential prey. There is some excellent footage in various documentaries showing it performing spectacular leaps in order to catch an insect perching on a tree branch or leaf a metre or so above the water surface. Different species of manta ray jump out of the water from time to time for no apparent reason. Some marine biologists are of the opinion they do this in order to rid themselves of external parasites which seems quite plausible. I am definitely no scientist, but am willing to stick my neck out on this occasion in support of this idea based on personal experience! If we follow the logic that a fish, unable to use either mouth or fins to get rid of a pesky and irritating sub-tenant, takes to the air as a desperate, last resort then I can be convinced that a hooked fish (like bass or trout) performs similarly to rid themselves of the hook. Therefore, next time you see a fish jumping out of the water with no apparent reason don’t discard the possibility that it may be de-bugging. If their environment deteriorate to such an extent that staying put becomes a serious survival issue, certain fish species have, over time, developed the ability to leave that environment and look for better living conditions elsewhere. One of these species is the African sharp toothed catfish which is equipped with a set of lungs allowing it to breathe outside of the water. This enables them to survive in an oxygen-poor environment long after all other species of fish have succumbed to the adverse conditions. However, at some point even the catfish may come to realise that staying put in a rapidly decreasing, mud clogged puddle spells certain death. Therefore, during the first substantial shower of rain they lunge themselves onto the wet ground and then propell themselves forward in a series of wriggling motions in an attempt to reach another water source. Although it can hardly be described as a dramatic “jump”, I am of the humble opinion that this behaviour is interesting enough to be included in this article. #6 – Candlelight and Dinner? In the Gulf of Mexico a certain species of ray, Mobula munkiana, get together in big schools at a certain time of the year and display a peculiar habit, namely throwing themselves into the air in a series of spectacular jumps. Scientists established that the location where these actions occur seems to be a nursery ground for that particular species, because they discovered a lot of juvenile fish feeding along the shore in close proximity where these jumps occur. They also learned that both males and females jump which lead them to an interesting conclusion. It appears that the fish jump in order to indicate that other fish of the same species are nearby. This behaviour leads to even more of the species congregating in the same area which gives rise to a higher likelihood of finding the right mate thereby decreasing the potential of any individuals missing out on a bit of romance. Aided by those wonderful tools of science and scientific observation we gain more and more knowledge of our natural world and the amazing creatures occupying it as time goes by. However, a lot of the explanations for certain animal behaviour are still shrouded in mystery and we can only resort to guessing at this point in time. My last thought on this topic is that fish sometimes don’t jump for any particular reason – they are just in perfect physical condition in the peak of their life and jump purely to display that to others, or for fun. Celebrating life, so to speak.